These are the most juicy fries you will have. Sounds weird but that's what you want for Portabella Mushroom Fries. And you will still get plenty of crunch with a crusty breaded coating. This Happy Hour gastropub favorite is easily made in the less noisy comfort of your kitchen following The 99 Cent Chef's clear and concise stop motion animated recipe video. 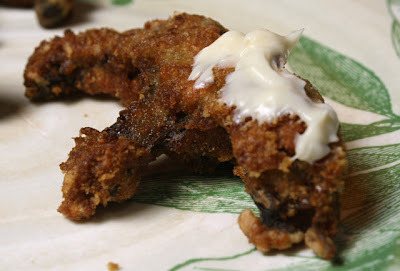 And a portabella mushrooms' mildly earthy flavor pairs perfectly with my Ginger Mayo Dipping Sauce. I like to use powdered garlic or ginger for flavoring boring mayo. 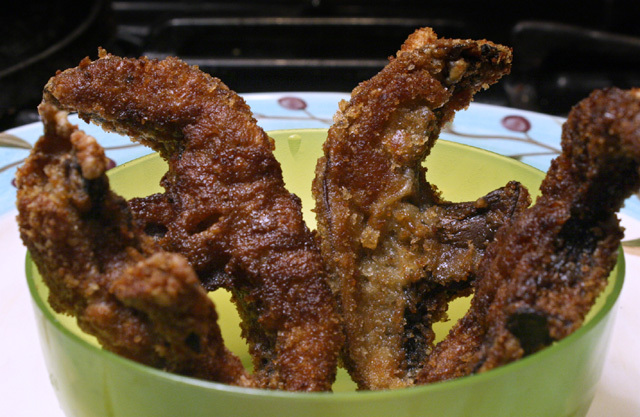 You can also serve the fried mushrooms with ketchup if you like. 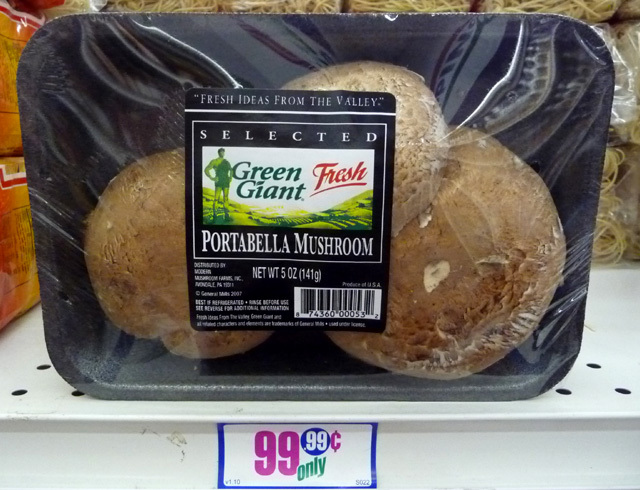 I often get packages of portabellas at my local 99c only Store. If you are not so lucky to find them on sale at your local grocery, it's okay to use standard white button mushrooms. Just cook them whole. I'm a fan of portabella mushrooms, they are so meaty and tender, and they cook quickly. 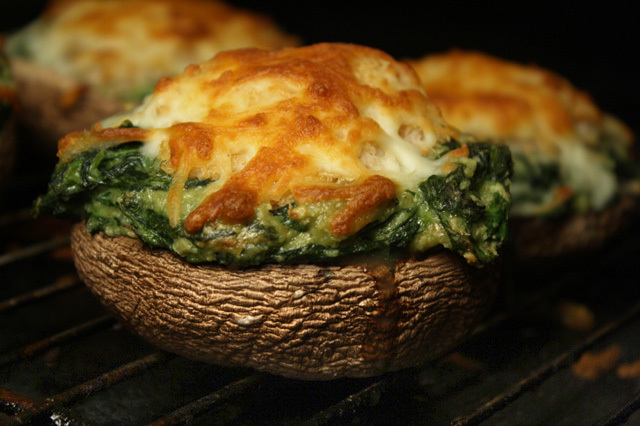 Just click on any of the following recipes to see what else you can do with them: Stuffed Portabella with Chicken & Cream Cheese, Portabella Crab Rockefeller (featured on the Cooking Channel,) and a Portabella Mushroom & Bell Pepper Cheeseburger. So if you are going to splurge on fat (or, cheat on your diet) make it with The 99 Cent Chef's Portabella Mushroom Fries. Or, if you just want to dine vicariously, then check out my uniquely animated video. 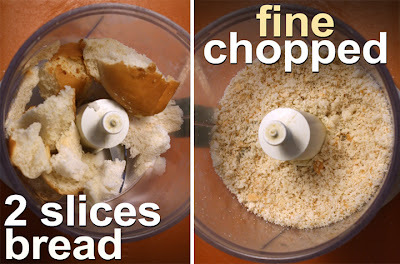 2 slices of bread (about 1/2 cup) - blended or fine chopped. Okay to use packaged breadcrumbs. Any type bread will do - even old hamburger and hot dog buns. 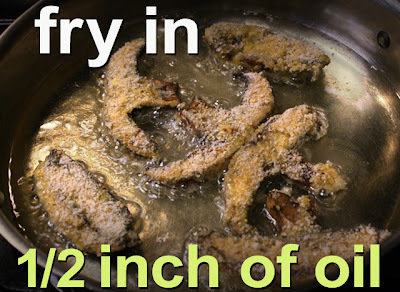 Oil for frying - about 1/2 inch deep in the frying pan. Salt and pepper to taste - you can season the raw breadcrumbs, or sprinkle it on cooked fries. *Depending on package size of mushrooms, you may need to add a little more flour, breadcrumbs, or egg. 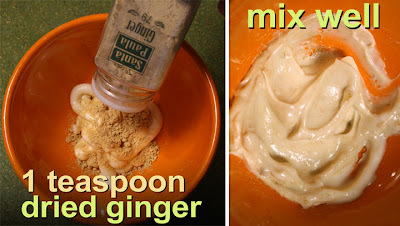 1 teaspoon of dried ginger - okay to use fresh grated (about 1/2 teaspoon or to taste.) Dried garlic powder is a delish substitution for ginger. To prepare, simple really, just mix the mayo and powered ginger all together, and store in the refrigerator until ready to use. With a damp sponge, remove any dirt off mushroom caps, then pat dry. Add oil to a pan (about 1/2 inch deep) over a medium-high heat. With a spoon scrape out the black fuzzy gills under the mushroom cap. Scrape until you start to see the beige flesh underneath - you don't need to remove every last bit. It's also okay to just slice the portabella mushroom whole, gills and all. If you are using small white or brown button mushroom, cook them whole -- just wipe off any dirt. Trim stems if they are dried out. 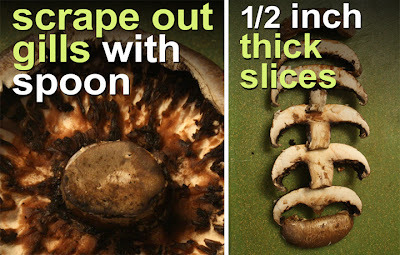 Slice mushroom into about 1/2 inch pieces. If you like thicker fries then make the slices even wider. Now to make the coating ingredients. First up are the breadcrumbs. I have a small food processor, but you could also use a regular blender, to chop up 2 slices of bread. With a bit of work you could also hand chop. It's okay to use packaged breadcrumbs, too. Tear bread slices into pieces, add to blender and pulse until breadcrumbs are fine. Spread out breadcrumbs on a plate. Next, whisk one whole egg in a shallow bowl. And finally spread out 1/2 cup of flour on another plate. To coat the mushroom slices, first coat all sides of a slice in flour. Next, add the floured slice to the egg wash, again coating all sides. Finally, add wet mushroom slice to breadcrumbs and sprinkle crumbs all over. 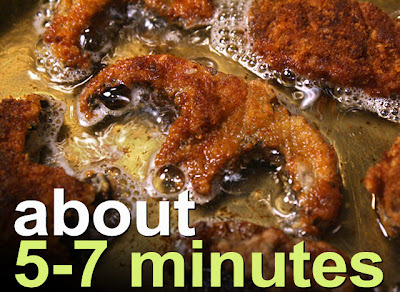 Repeat the steps until you have a plate of coated mushrooms ready to fry. You can work in batches if you have a lot of slices. The oil should be nice and hot by now. Carefully add the smallest slice to make sure the oil is up to temperature -- the slice should sputter and bubble right away. Add the other slice to fill the pan. Total frying time may vary, but should be around 5 -7 minutes for each batch of mushroom slices. Mainly watch the slice edges in the oil and look for a nice golden brown to form. 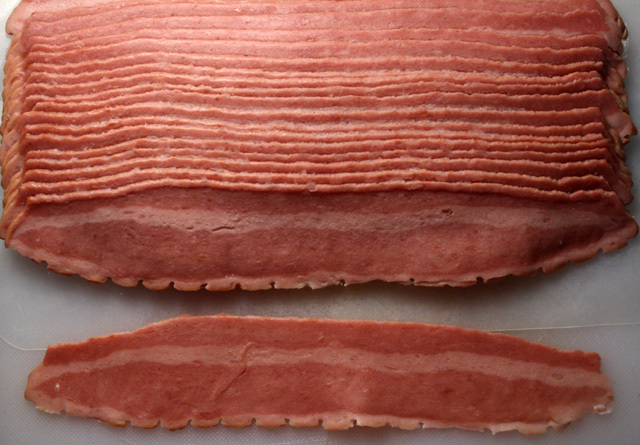 Once this happens, turn the slices over to brown the other sides. The mushrooms will tenderize whether the breadcrumbs are light brown or dark brown -- it's up to you how you like it. When portabella mushrooms are done remove and drain on a wire rack or on paper towels. Serve with my Ginger Mayo Dip. You can also use regular ketchup. You can add spices to the breadcrumbs for extra flavor. Of course, I like Cajun spices. 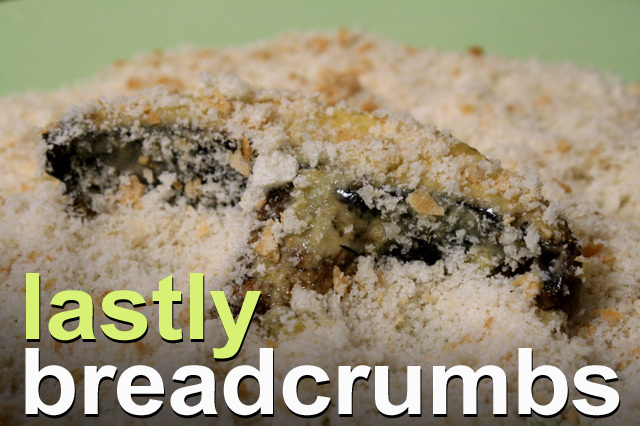 Dried parmesan is a tasty addition to the crumbs. Oven cooking is a lighter way to go. I tried oven cooking the fries, but they dried out and the breadcrumbs didn't brown well. Next time I would first lightly brown the breadcrumbs in a tablespoon of oil in a frying pan (about 2 minutes.) Coat the portabella slices as listed above. Heat the oven to 375 degrees and add the slices on a wire rack or baking pan. Bake for about 20-30 minutes. Slice into one fries at 20 minutes to see if the mushroom center is tender and moist, if so, then they are done, if not then check back every ten minutes. You could also try slice the mushroom a little thicker to keep the fries from drying out. Give the baking method a go, if you want to save on oil and calories. And finally, if you don't have portabella mushrooms on sale, it's just as delicious to use easy-to-get small button mushrooms. I would coat them as described above and fry them whole. To quote U2: "but, I still haven't found what I'm looking for." And that is finding a decent Mexican frozen Deal of the Day for around a buck. 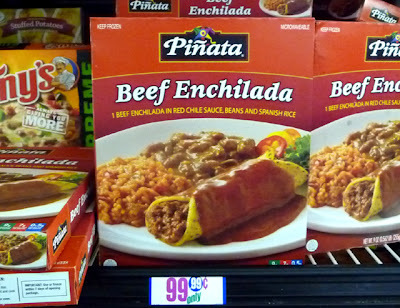 In my latest meal review of Pinata's Beef Enchilada dinner, it's getting better but still no cigar. I reviewed a Queso Enchilada Dinner by El Charro last year that was quite tasty (click here), but I hate to say that this Beef Enchilada comes in a distant 2nd place. I'll start out by saying that the beans and rice are the best part of this frozen dinner. There are are a few whole beans and real rice kernels. 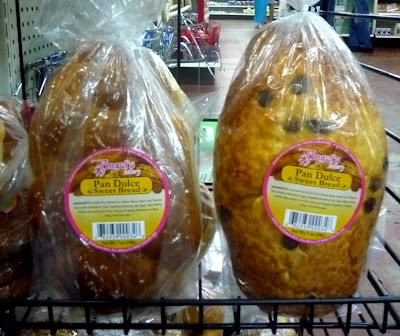 I always like it when you can discern what you are eating. 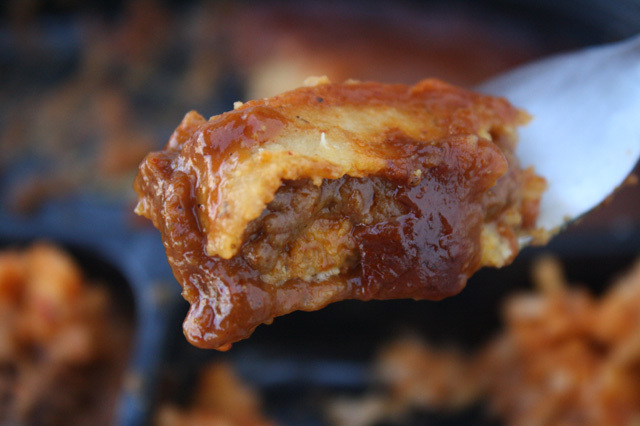 But as usual the beef enchilada part microwaves to a mushy mess. The "beef" filling has no texture -- I don't expect chunks of meat, but a soupy filling is just not right. And the corn tortilla gives no resistance to even a spoon. But I did like the enchilada sauce -- there is a real Mexican spiciness. 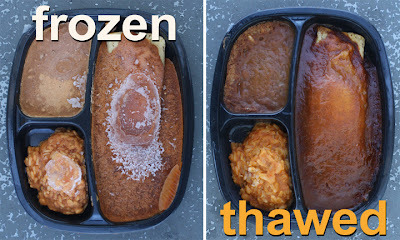 And as usual with a lot of frozen dinners, the ingredients list is longer as the U.S Constitution. I'm sure a few less chemicals would not affect the flavor. So on The 99 Cent Chef's rating scale, 9 being best, I give Pinada's Beef Enchilada Dinner a generous 5. I'll keep searching for a cheap, but decent, frozen Mexican meal -- and I'll let you know when I find what I'm looking for! The Shutterbug Chef is bringing the neon-lit streets of Los Angeles to your computer screen in my latest exploration of nighttime nosheries with Restaurant Nocturnes XI. Again, I'm all over the place: from the South Bay to East L.A.., and Little Osaka (West L.A.) to the Kosher Corridor on Pico Boulevard. And at the end of this post I list all 13 restaurants I shot, along with their website link or a review. Hop Louie is a dining time capsule built the 1940s and lodged in a movie-set designed pagoda. Located in Downtown-adjacent Chinatown, this hipster and tourist hangout keeps on keepin' on. I shot here on a Saturday night last month, as the bar jukebox on the first level was blasting Kool and the Gang's "Hollywood Swinging," while I watched a steady stream of denizens coming and going through the side door for a smoke, or plotting out their next night moves on cellphones. And the booze and chow are cheap here. Listen in on an audio clip I got of the waitress's menu picks for the upstairs dining room. 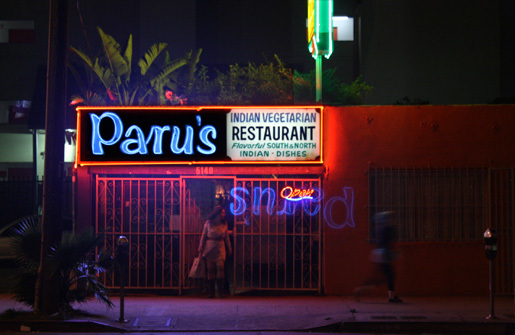 For vegan dining, Paru's Indian Restaurant has been a fixture on Sunset Boulevard in Hollywood since 1979. You have to press a buzzer to get past the imposing metal gate, but once inside you walk though a pleasant courtyard and are greeted by the soothing soundtrack and fragrant aromas of India. I had a hard time pulling away after recording the waiter's scrumptious menu rundown, but I was on a nocturne tear, with more restaurants to shoot that night. 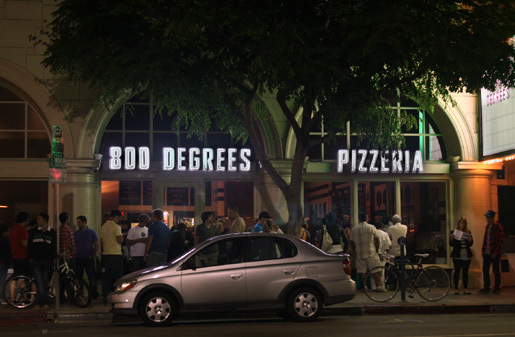 If you're looking for a boisterous atmosphere, hit 800 Degrees for pizza -- it's located in Westwood down the street from the UCLA campus. Don't worry if you encounter a long line of hungry students: the fresh-fired Neopolitan pies are ready in just 60 seconds, due to the 800-degree ovens. Opened in January, this cafeteria-style pizza joint was created by the locally lauded Umami Burger Group. Prices start at $5.15 for a plain Pizza Marinara, and go up a dollar with each meat, cheese or veggie add-on. And the extra topping list is a long one, including Rosemary Ham, Rock Shrimp, Meatballs, Smoked Provolone, and Eggplant. Appetizers, salads and specialty pizza pies are also on the menu, and you can satiate your appetite until 2 a.m.
Come rub elbows with the 1%ers at Melisse in Santa Monica, a 2-star Michelin awarded eatery. You'll dine on a $150 per person Tasting Menu of 10 courses that includes: Egg Caviar, Japanese Yellowtail and and a Sweet Corn Agnolotti (pasta) with shaved Black Truffles. They also have a four-course Tasting Menu for $115. I'll allow the Maitre'd to give you the decadently delicious descriptions. If your wallet is light tonight, take the Gold Line Metro rail (my video blogpost here) for a 10-inch Huarache that only costs $4.23 -- it's made in Boyle Heights in East L.A. by the recently opened Antojitos Carmen. A Huarche's like a corn masa pizza loaded with beans, lettuce, salsa, crema and your choice of squash blossom, corn fungus, mushroom, potato, asada, carnitas, or al pastor. Chef/owner Carmen Castellanos was a Breed Street cart vendor lauded by the likes of L.A. Times reviewer Jonathan Gold -- until the cops and food inspectors hassled her into this legitimate brick and mortar. Now you can enjoy her authentic Mexican fare night and day. Tag along to Redondo Beach in the South Bay, where a literal hole-in-the-wall, The Standing Room, serves the Burger of the Year -- so says local paper the Daily Breeze. 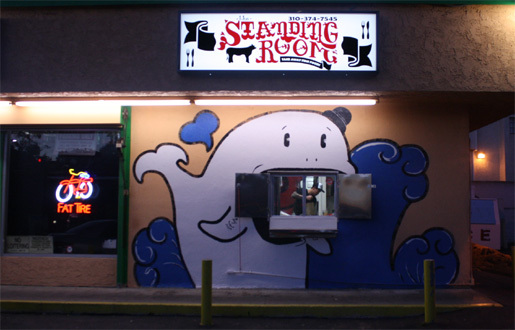 Opened a year and a half ago, Standing Room is located in the back of Catalina Liquor Store, where you belly up to a counter and order to go. (Outside are a couple of tables with umbrellas at one end of the parking lot.) Their 1/2 pound burgers are packed with savory flavors like: Caramelized Onions, Tomato Jam, Smoked Gouda Cheese, Habanero Cream Cole Slaw, and...well, I'll just let the chef describe the Dressed Burger to you in my video clip. And I finish up with a tongue-lashing from the proprietor of Kolah Farangi. 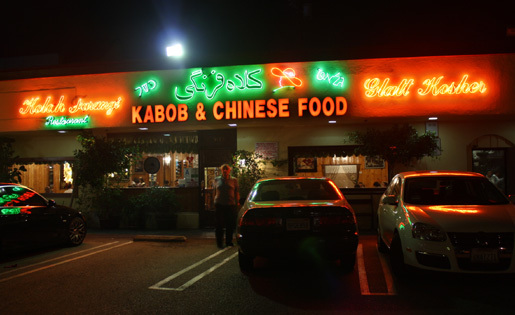 Located along the Jewish corridor on Pico Boulevard, this kosher Middle Eastern and Chinese eatery is one place you don't want to stop to take a picture of their cool neon facade. I could tell I was in for an earful just watching the owner pace and give me the evil eye at the doorway while I was snapping away. I always like to end a Restaurant Nocturne video with a bang, and man is this the Big Bang. Just listen in as I try to convince the owner to let me shoot a few more frames from the parking lot. Will this Hardheaded Chef finally get his just desserts and end up in the slammer for trespassing? Or can the Silver-Tongued Cuisiner talk his way out of another jam? You'll have to watch the end of my Restaurant Nocturnes XI video below to hear the surprisingly dramatic finale! Play it here. Video runs 8 minutes, 3 seconds. Restaurant Nocturnes I, Restaurant Nocturnes II, Restaurant Nocturnes III, Restaurant Nocturnes IV, Restaurant Nocturnes V, Restaurant Nocturnes VI, Restaurant Nocturnes VII, Restaurant Nocturnes VIII, Restaurant Nocturnes IX, Restaurant Nocturnes X. Like a green heat-seeking missile wrapped in turkey bacon, the latest 99 Cent Chef appetizer is one intense flavor bomb! 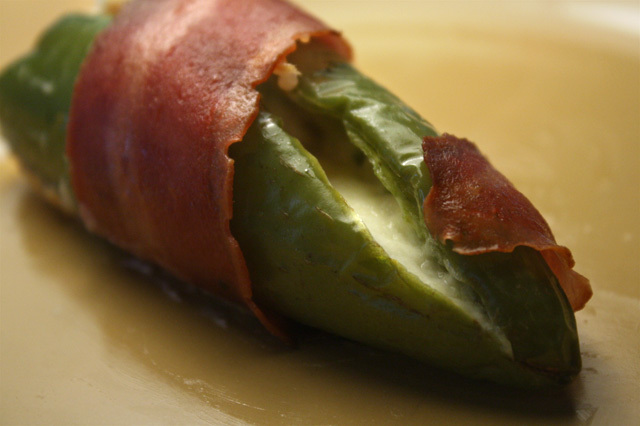 A Turkey Bacon Wrapped Jalapeno with Cheese will separate the men from the boys, and the timid from the brash -- this recipe is not for the faint of palate. This dish should earn The Chef hazard pay for handling a bag of spicy jalapenos. You need radioactive-proof mitts to keep off the fiery chile oils. And don't even think of satisfying that itch on your nose -- touch the skin anywhere near your eyes and you will be sorry. But boy is it worth the risk. Melting cheese cools off some jalapeno spiciness, and a slab of savory turkey bacon brings this appetizer to delicious heights. The other recipes called for wrapping jalapenos in fatty (but delicious) bacon; that's when I remembered the turkey bacon in the back of my freezer. At first glance turkey bacon looks real -- but upon opening the package I noticed it resembles those fake plastic food display toys in the window of a Japanese restaurant. I pinched off a piece to try: the texture is baloney-like and the flavor has that liquid smoke tinny taste. This was not a good start, but I was determined to push through and see what happens. And things turned out much better than I anticipated. After stuffing the jalapenos with cheese, I wrapped them in a turkey bacon slice and roasted a pan full at 350 degrees for 45 minutes. I figured the turkey bacon would dry out and taste like a piece of hot asphalt -- wrong on both counts. The bacon held up well to slow cooking (maybe the steaming jalapeno kept it tender,) and the taste only got better when cooked through. 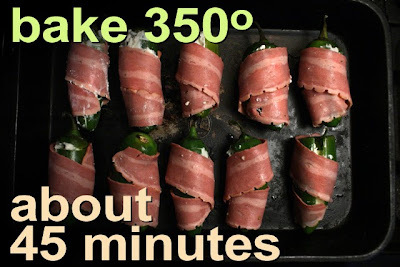 While you will miss that crunchy pork bacon texture, you will sleep better, having not eaten your daily calorie limit with one cheesy stuffed and bacon wrapped jalapeno. I always find 4 ounce pucks of Mexican cheese, Queso Fresco, and cream cheese cheap enough. You can use any favorite inexpensive cheese, either low fat or regular. This is a recipe you may want to get out those bright yellow rubber gloves for, when stuffing my Turkey Bacon Wrapped Jalapenos with Cheese appetizers. And make sure to serve with a tall cold drink! 12 jalapenos - depending on size. I used big fat ones in the 2 - 3 inch length range. Cream cheese - a small container of about 5 ounces. Okay to substitute a firm cheese like mozzarella, cheddar or Swiss. 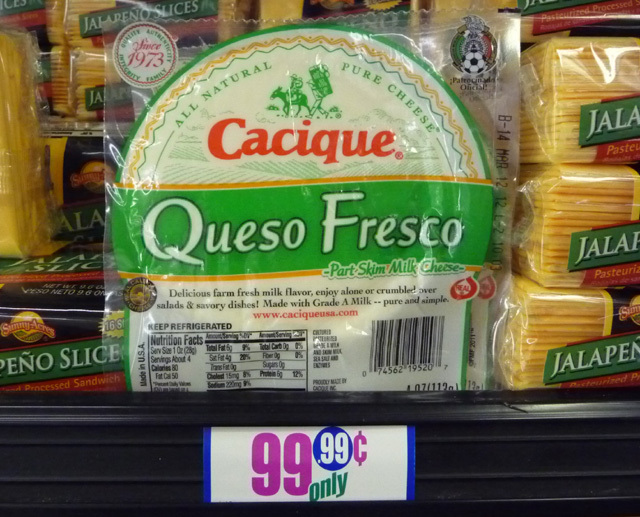 Queso Fresco - about 4 ounces of Mexican cheese. Okay to use any favorite cheese you have. 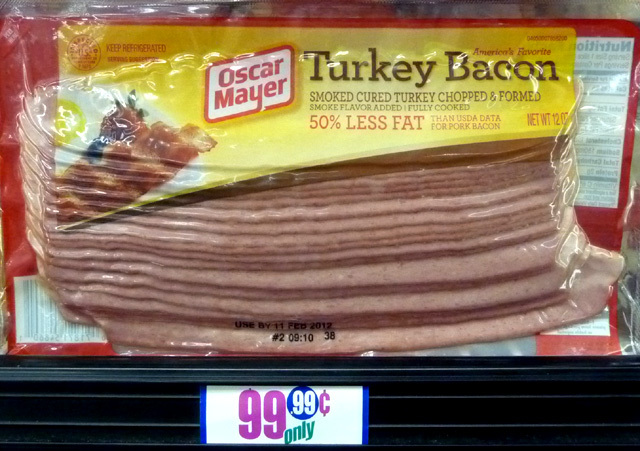 Turkey bacon - one package. If you insist, it's okay to use regular bacon. Allow the cream cheese to soften at room temperature. 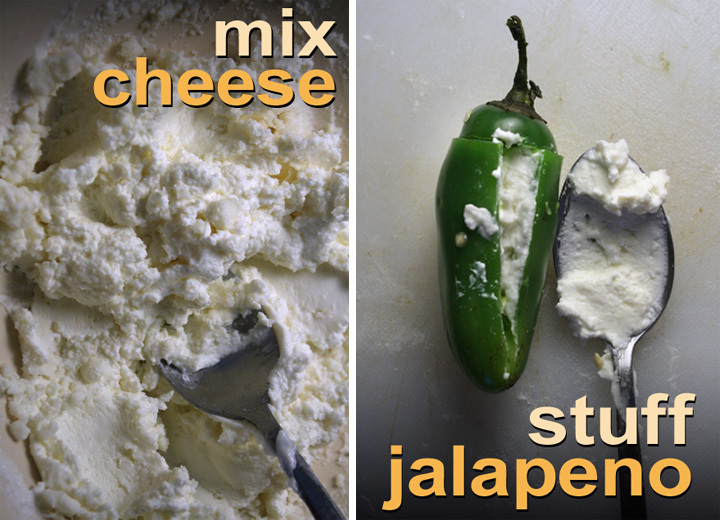 Add it to a bowl and mix in any other type of cheese - I used 4 ounces of Queso Fresco. 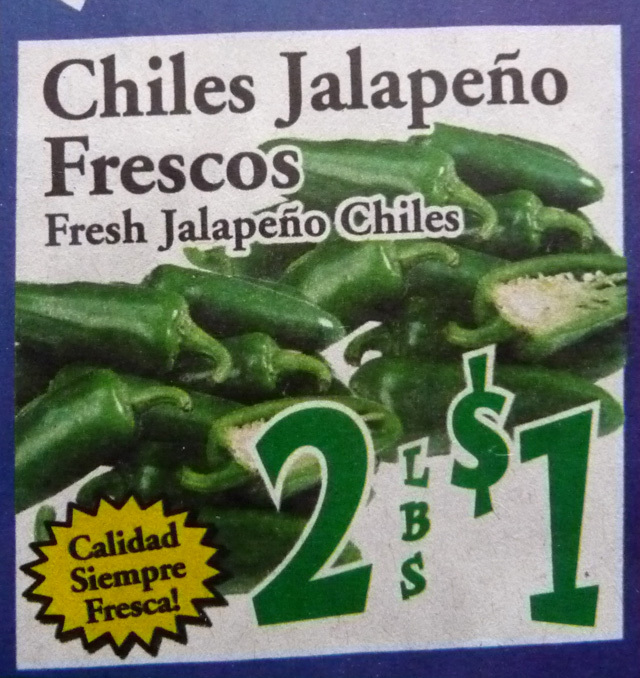 Lay each jalapeno on a flat surface to see how it naturally lays flat. 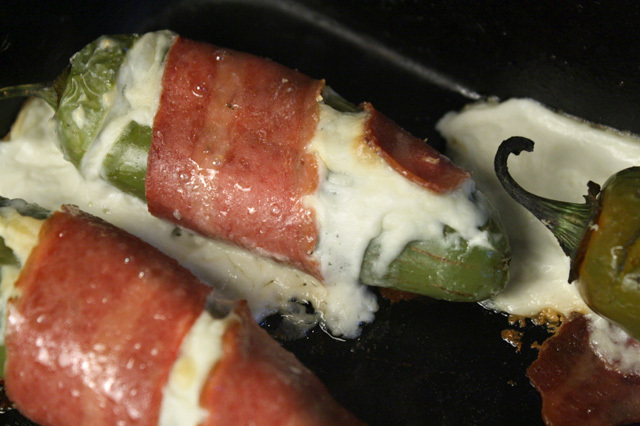 You want to slice the side that now faces you, so when the stuffed jalapenos roast, the cheese won't leak out. 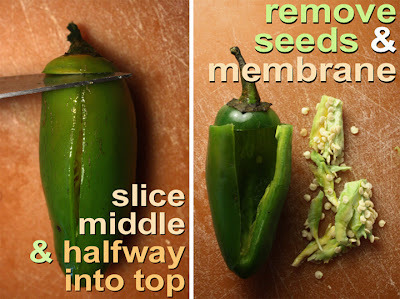 Slice each jalapeno lengthways and make one more slice across the top, near the stem, to form a cut in the shape of a "T". 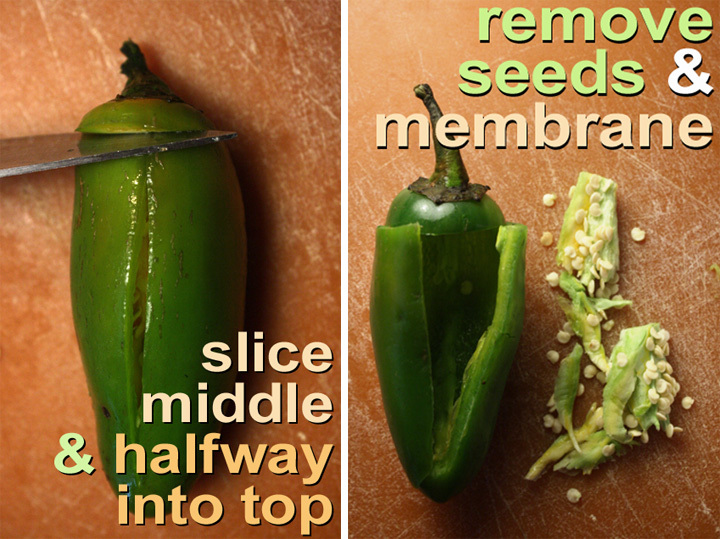 Open up the jalapeno and remove seeds and the lighter membrane strands -- this is were a lot of spiciness resides. Be sure not to touch you face when handling jalapenos, because you will inevitably get the heat too close to your eyes. Fill each jalapeno with cheese mixture. 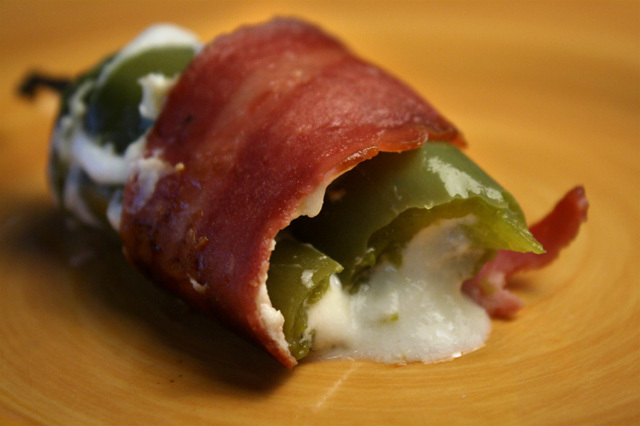 Wrap jalapenos in slices of turkey bacon. You can attach with a toothpick if necessary. 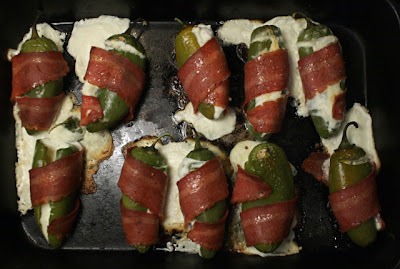 Place stuffed and wrapped jalapenos in an oven pan and roast uncovered, about 45 minutes at 350 degrees. Check after about 30 minutes to make sure turkey bacon does not burn black. Mine just got a deep mahogany brown. The cheese is extremely hot out of the oven, so allow to cool for 5 minutes before serving. If you use real bacon, just bake until it is brown and crispy as you like, about 30-45 minutes. If you are sensitive to spiciness, then this recipe is not for you. However, taking out the seeds and membrane, plus roasting the chiles, does take out much of the heat. 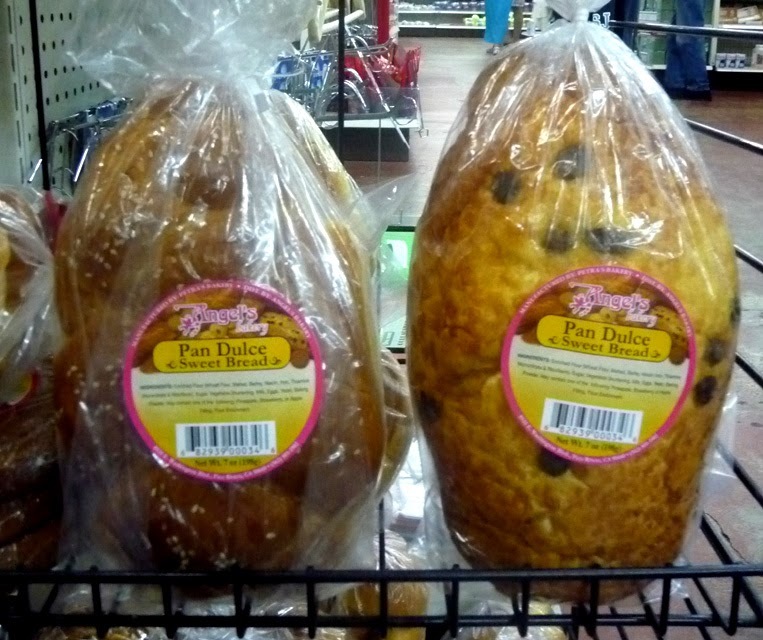 While I found it suited my tastes, my wife could only eat one half at a time. Hey, that left them all for me! 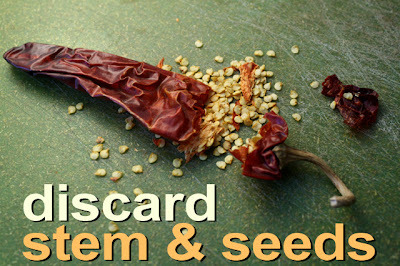 You may want to wear rubber gloves and fish out the seeds with a small spoon or butter knife -- or even wash the seeds out under running water. 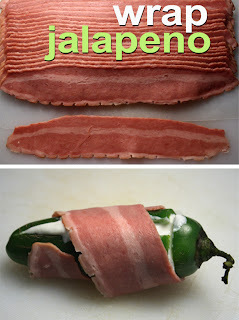 If you use smaller jalapenos, then slice the bacon in half, if it is too long. Get out the tortilla chips for the Chintziest of Chef's latest recipe. What you do with a bag of dried California chiles? How about the most pungent Chile Salsa you will ever have! Dried California chiles have the flavor of enchilada sauce from a can, but much more intensely flavored. 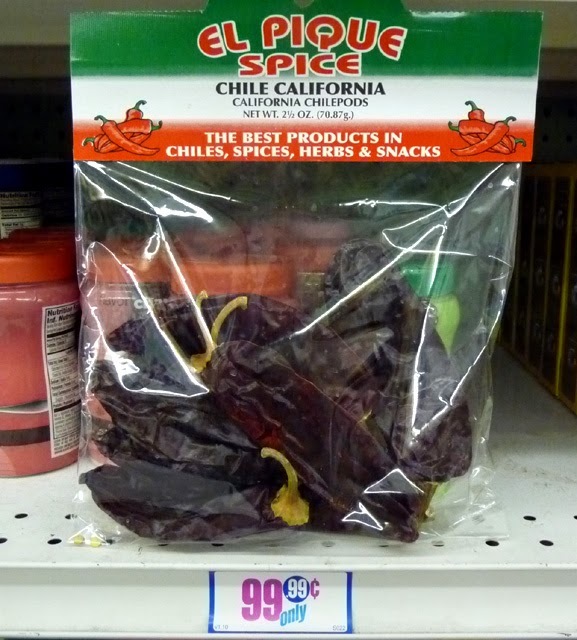 Although called a chile, a California dried chile is not a spicy type. 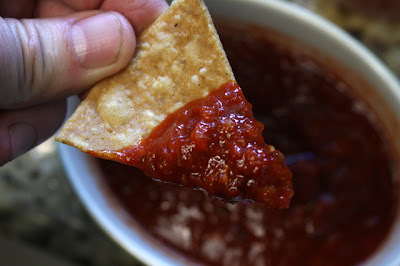 You could use my Chile Salsa (or Salsa Roja) as a dip for chips, or spoon it into your favorite taco and burrito. My Salmon Enchilada Recipe (click here) would be even more delicious using this Chile Salsa. Spoon this cheapie, but flavorful, salsa on any bland dish to kick it up a notch. If your market has different dried chiles, like pasilla, ancho or poblano, guajillo or Anaheim, just use my recipe and make your own salsa variation. Dried chile colors go from a deep wine red to inky black. 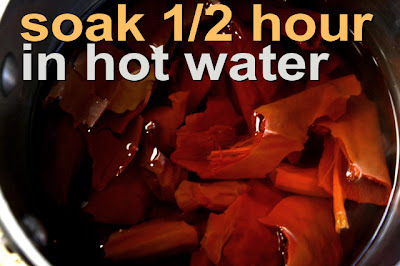 The technique is the same: break off the stems, pour out the seeds; then steam the skins a half hour in hot water. Finally, blender the softened chiles in some chile broth and a little bit of garlic and onion. It's really easy to do and there is nothing like the intense flavor of fresh made salsa. 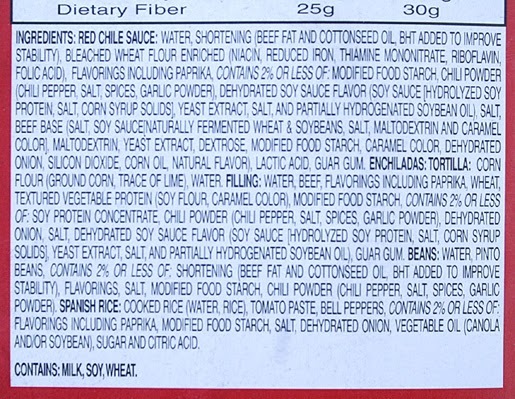 There are also packages of spicy dried chiles, too -- they should be labeled as "hot." It's the same technique, but be ready for a spicy kick! 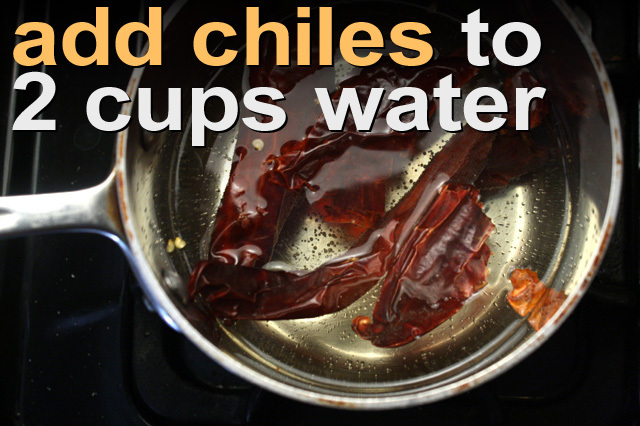 2 cups of water - enough to cover dried chiles. 1/4 onion - roughly chopped for blending. Or leave out onion for a more intense chili flavor. 1 clove garlic - or, a chopped teaspoon from a jar. Oregano - A small sprig. Jalapeno - You only need a small slice of jalapeno (fresh or from jar.) Add a little at a time to reach desired heat. 1 cup chopped tomato - fresh or canned tomatoes. Cilantro - a couple tablespoons chopped. Remove stems and seeds from dried chiles. Bring water to boil in a pot then reduce to simmer. Add dried chiles, roughly breaking them into big pieces as you add them. Simmer about 10 minutes. Turn off heat and let the chiles soak in the hot water about 30 minutes to soften. Pulse and blend ingredients until you get a smooth tomato sauce-like texture. Add a pinch of salt and pepper to taste. If you want extra spiciness, now's the time to add small slice of jalapeno -- add a little at a time to reach desired heat. Finish with a squeeze of lime, optional. 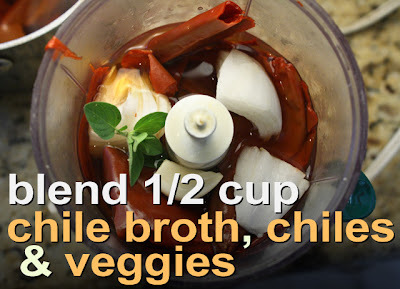 I added a 1/2 cup of chile broth, you can also add more or less broth for a thick or thin salsa. Blend in a cup (or less) of chopped tomato (or tomato sauce) for a milder Chile Salsa -- it's a more traditional Mexican restaurant style. 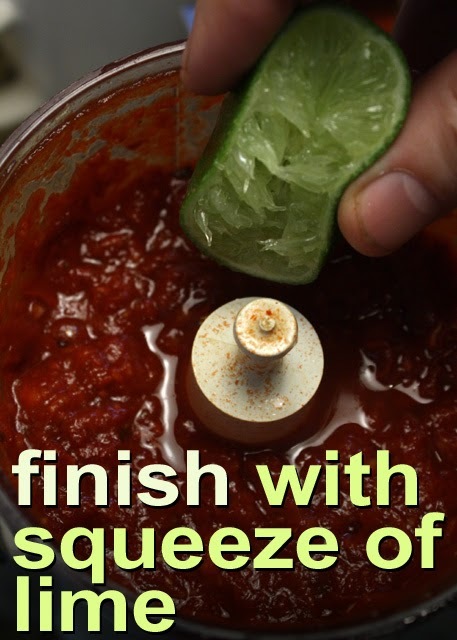 If you want the salsa extra chunky then don't blender the tomato, just hand chop it. A couple tablespoons of chopped cilantro is a cool addition. Add it to the blender stage, or just mix it in before serving. Try out other dried chilis you may find, some will be hotter, so taste after blended before for you serve it, so you can describe it to your guests. This Budget Cuisinier does not live by 99c only Stores alone. Sometimes I go for broke and hit up dollar stores. My latest find is Dollar King in Glendale, located in eastern L.A. county. For a dollar store, this one is a good one. Glendale could be called "Little Armenian" with all the kebob and Middle Eastern eateries. When I lived there, tiny mom-and-pop Armenian grocery stores were my main cheap source for tomatoes, persimmons, cucumbers and other fresh produce. 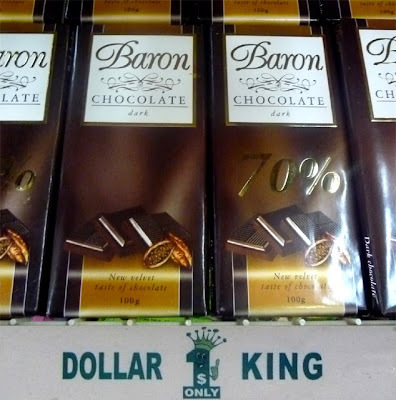 So with this Dollar King, the locals have another great market for all sorts of dried and precooked foodstuffs. Dollar King is quite large and the aisles are long and well stocked. You can read the Yelp reviews by clicking here. 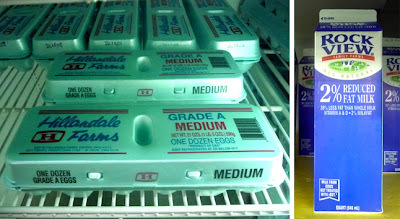 There is also a cold deli case with eggs, milk and rows of cold drinks. They don't seem to presently stock cold cuts, yogurt or juices...yet. As with all dollar stores, they carry an over-abundance of cookies, sugary confections and oversalted chips -- so you need to have your junk food guard up! They have many aisles of typical dollar store fare: batteries, dishes, clothing, party decorations, cleaning supplies, sunglasses, hardware, etc. I've only been there a couple of times so I'm sure the stock is changed out often, if they operate anything like the 99c only Stores. There is a good selection of dry beans, bread, tortillas and bags of chips across from the deli case. I was especially impressed with the 10 ounce packages of dried soy beans, yellow and green peas. 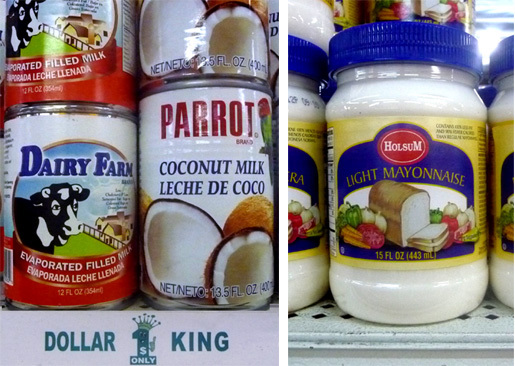 They also carried 6 ounce packages of harder to find red lentils and black-eyed peas. You could easily make a delicious pasta dinner with just Dollar King ingredients. I found canned black olives, pasta sauce and several kinds of pasta -- even dried parmesan. 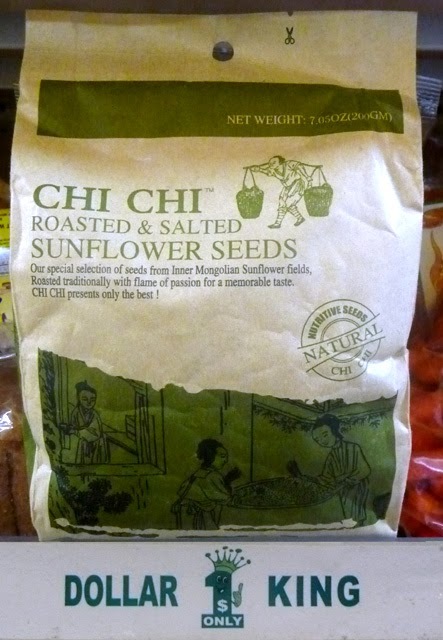 The 99c only Stores are know for unusual food finds and Dollar King has a few of their own, including: Mexican sweet bread "Pan Dulce," and roasted sunflower seeds called "Chi Chi" from Inner Mongolia! And if you are craving confections, there are large bars of European style "Baron" dark chocolate.